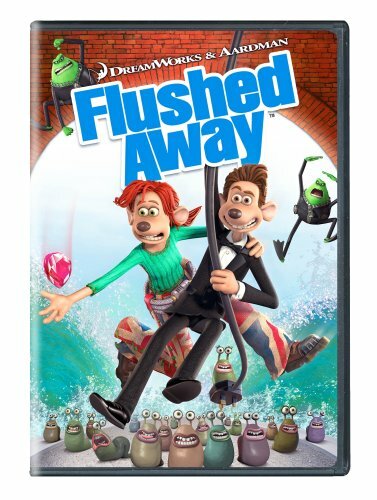 “Flushed Away” is a very well done movie, with a great deal of humour which will appeal to adults while going right over the heads of many children. Still, phrases like, when referring to last night’s curry, “I have a bum like a Japanese flag” may not escape some older children, nor attention drawn to the shape of the heroine’s bottom. And even if they do, “Flushed Away” has enough crude humour that the kids will get to make adults cringe. For example, when the hero, Roddy, first finds himself floating downstream in the sewer, he clings for dear life onto something that bumps into him, only to look at it and realize that it appears to be a piece of human waste – which is quickly revealed to actually be a candy bar. There is also a fair amount of name calling (“stupid”, “idiot”, etc.) and quite a bit of attempted violence, which often fails or is comical, but is still (attempted) violence. For our own family standards, we would probably let a child of 12 or so see it (maybe), but not a child younger than that. P.S. The slugs are absolutely adorable and are the best part of the movie.